A couple of weeks ago in the link round-up, I featured a video from Mike Morrison. Mike’s year-in-the-making video attracted plenty of attention, and is at the bottom of this post in case you missed it. Eugene Ofofsu has already used this format on a prize-winning poster. Let’s have a look at Morrison’s template. Morrison’s design has four components. An extremely large take away message in the middle. 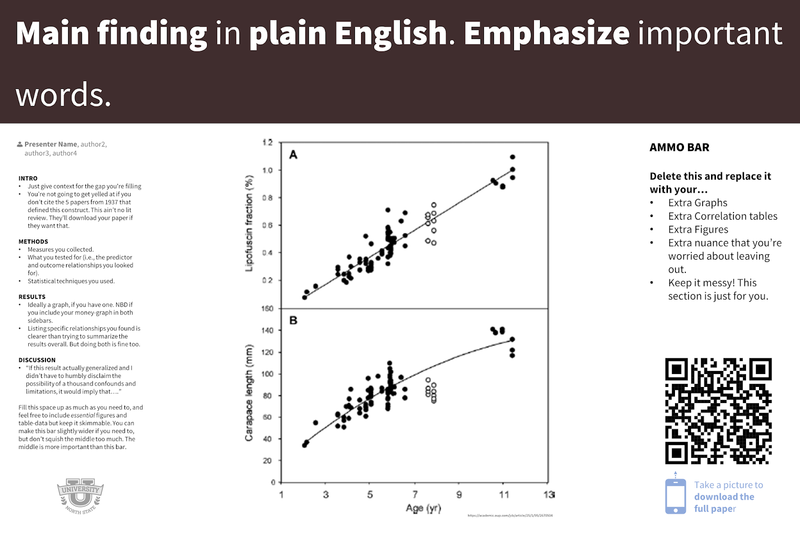 This is the biggest difference between Morrison’s design and most academic posters. 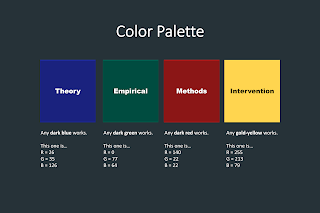 A structured abstract in a sidebar on the left. Fiddly bits for superfans and aficionados in a sidebar on the right. A QR code in the bottom middle. 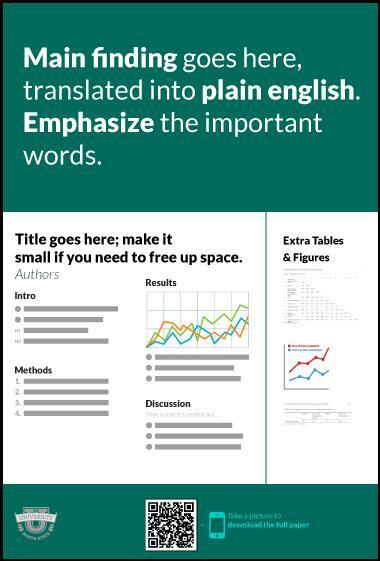 While I don’t share his deep pessimism about poster sessions, particularly presenting (“nothing's worse than presenting a poster”), Morrison’s design is thoughtful. In particular, it takes the principle I have often espoused that “Nothing should compete with the title” and “The title is 90% of your communication effort” and runs with it. The central take home message acts as the title of the poster. Morrison does include space for “Title” on the left sidebar, but a title is superfluous with this massive take home message. Besides, most titles are not one word, and the space any typical poster title would use in that left sidebar would probably be significantly larger than shown here. I admire the push to summarize the work in a single sentence. But let’s be honest. Getting to that single sentence is... very hard. Many academics, trained in nuance and exceptions, struggle to cut words. The design does make a few assumptions that might not always hold. 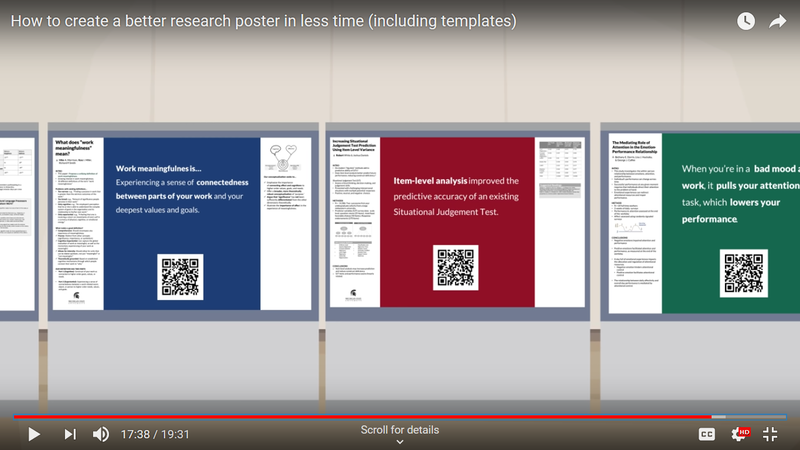 First, near the end of the video, Morrison simulates a “walkthrough” of a poster session with this billboard format. 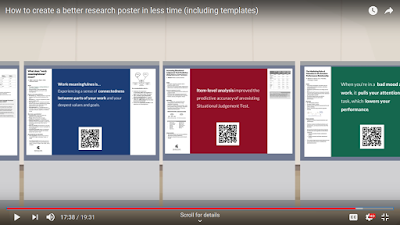 In the next screen, a few real academic posters are going to move past you at a walking pace. See how much information you can absorb. Now try these same posters you just saw translated to the new design. Now, this is gonna be a little unbelievable and jarring at first, because when people see this, they don’t believe that these clear findings came from the posters they just saw, but they did. Here’s a screenshot of this demo. Notice anything? Anything missing? There are no people. There are no presenters or audience members. This is an empty room. In most sessions, there will be people that can potentially block the view of the bulk of the poster, where Morrison recommends putting the take home message. Morrison’s portrait version of the poster fixes this. But it looks much more like a more familiar poster format. Second, Morrison proposes colour coding the backgrounds. I think it would be extra efficient to use colours that prime people’s expectations about what type of poster they're about to see, because they’ll notice the colour first. 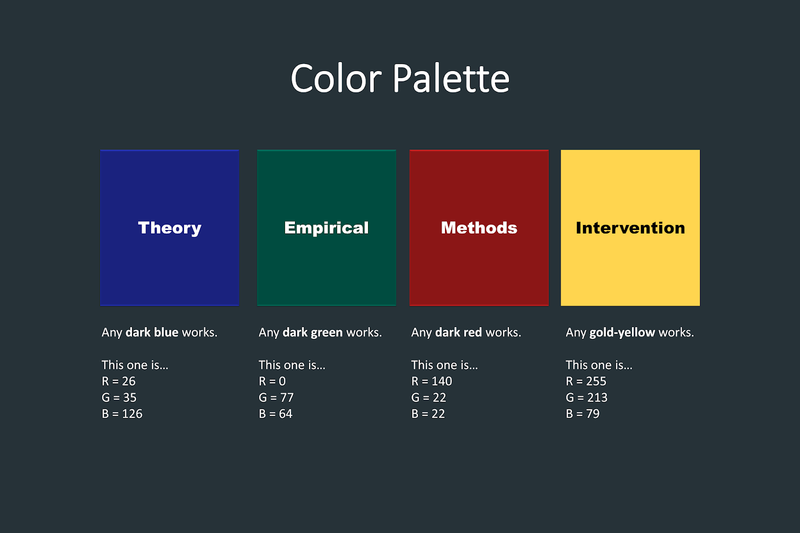 Like, we could use green for empirical studies, because they’re the most common; blue for theory; red for methods, and; yellow, the most attention-getting color, for that rare and wonderful intervention study. While colours do have things that they suggest, colour associations are usually derived from nature (reds and oranges and yellows are “hot” because they’re the colour of sunlight and fires; greens and blues “cool” because of plants, sky, and oceans) or associations drilled in from an early age (red for “stop” and green for “go”). The coding system suggested by Morrison would be arbitrary. The only way they would be meaningful is if the organizers set them out in advance, and aggressively enforced them. Most conference organizers are very “hands off” with posters. Third, it assumes no audience member ever plans what posters to visit in advance. In Morrison’s description, the only way people find posters that interest them is by wandering the halls. There are no online lists of titles and abstracts ever mentioned. 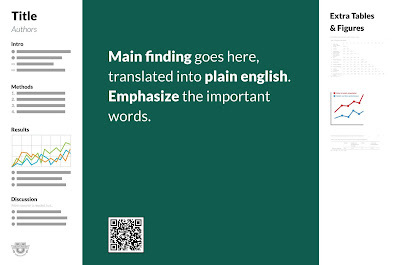 As an audience member, you have the power to make best use of your time by searching out what posters you want to visit before the conference. As a presenter, you have the responsibility to respect people’s time and be able to tell them what’s going on in a few minutes. Morrison wants someone to walk through a poster session and quickly get something meaningful from every poster. But there are meetings where the sheer number is still going to make that impossible (like the massive geology and neuroscience meetings). Preparing in advance is almost the only way you can get something meaningful from the meeting. Fourth, Morrison puts a lot of stock in QR codes. I have written about them often on this blog. I have seen far more people put QR codes on posters than I have ever seen people taking pictures of them. Whatever their value in theory, they seem to be little used in practice. In his PowerPoint template file, Morrison says of the “ammo bar” on the right hand side, “Keep it messy! This section is just for you.” If you truly want something that is “just for you,” keep it off the poster. Put it in a notebook or leave it on your tablet. Otherwise, people can see it, they will look at it, and they will be judgey about what is there. It’s like an artist who shows work they are not happy with in an exhibit or display. If you show bad work, people will think it’s because you can’t tell the difference between the good and the bad. It’s not a good strategy. Morrison, like many academics, is very focused on written content. Yes, there is a lot of paring down that written content to the essentials, but it’s still reading, and reading is hard. And when you see his walkthrough of a poster session, the overwhelming impression is sentences on blocks of colour. And all the type is the same basic sans serif. It is visually dull. Morrison’s approach underestimates the appeal of visuals. I suggest pairing the big take message with a big inviting picture. 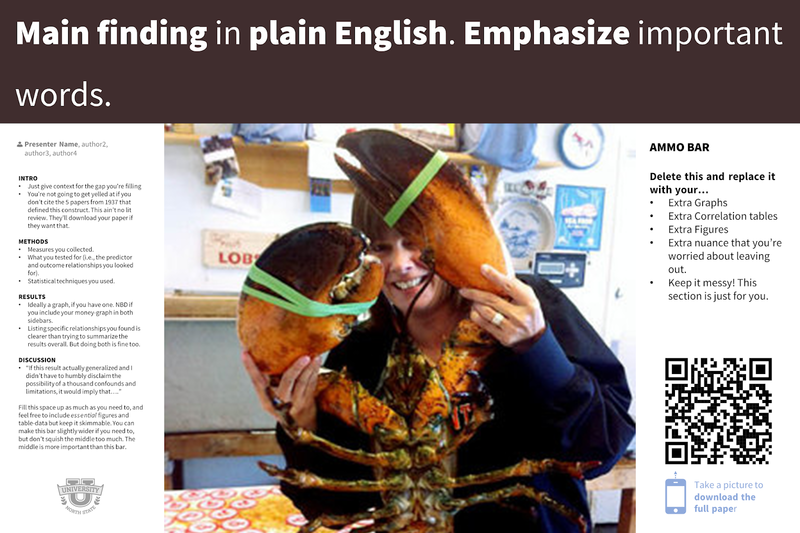 In this revision, I have moved the title up, so it’s always visible above people’s heads. The space saved is used for a big, bold picture that relates to the topic, so people can tell visually what the poster is about. The colour of the title bar is picked up from the picture with the eyedropper tool. 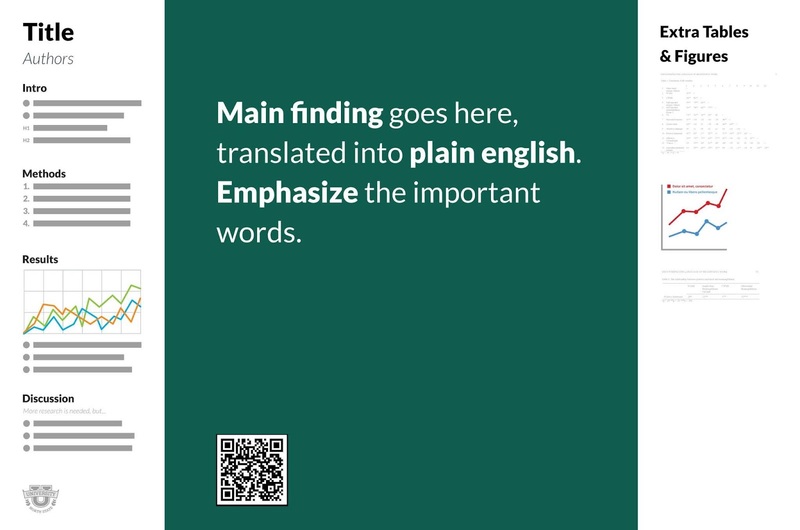 The QR code is moved over to the “fine print” are in the lower left. And while we’re at it, let’s move the typography out of the 1980s and into the 21st century by replacing tired old Arial with Source Sans Pro. Both fonts are straightforward sans serifs. Source Sans Pro has the advantage of making the differences between some letter forms more distinct, notably lowercase “L” and capital “I”. You could certainly make bolder type choices that might give the poster more personality. Also note that in revising the poster’s take home message, I was able to shorten it from twelve to eight words, a 33% savings, with no loss of meaning. Being concise is hard, even when you are deeply focused on it. I suspect that some will argue that a poster should be all about the data. 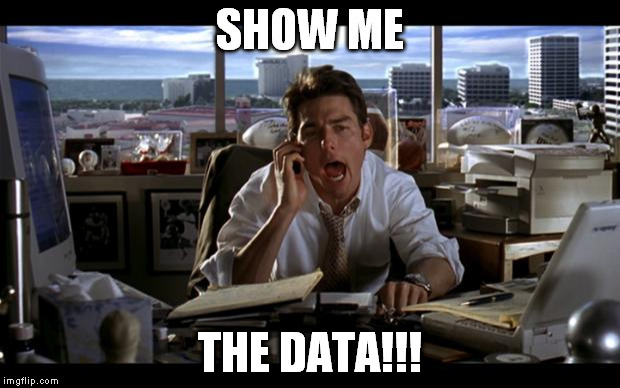 So why do I suggest a photo and not the all important data? Because data alone usually render a poster anonymous. Both this poster and the one before it might be about lobster size, but you can’t tell that at a glance from a scatter plot. Reading words is hard. Interpreting graphs is harder. A scatter plot can represent ten thousand things. 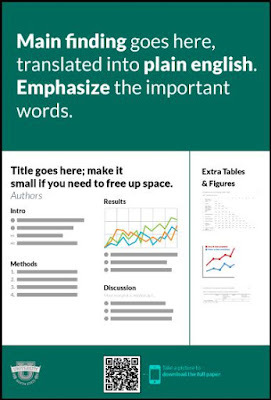 Data doesn’t signal at a glance what the topic of the poster is. See the discussion of Scott McLeod’s “big triangle” for more. 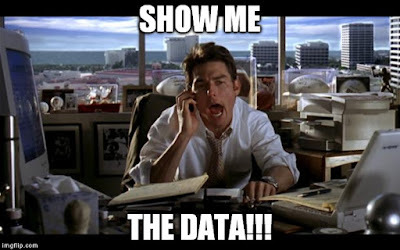 A wall of data points is not better than a wall of text. See also threads by Amy Burgain, Aresny Khakhalin, and Juliane Fenandes. Mike has provided templates here, and is working on a study validating this design. He is looking for grad students to participate. You can email him at Mike.A.Morrison@gmail.com. 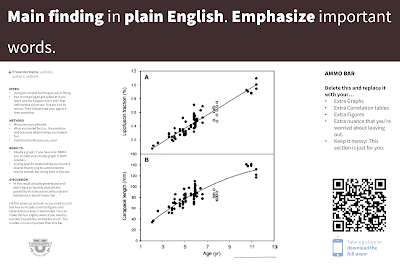 She told me that for the whole time she was standing at her poster, presenting, she wished her graphs and plots were larger. 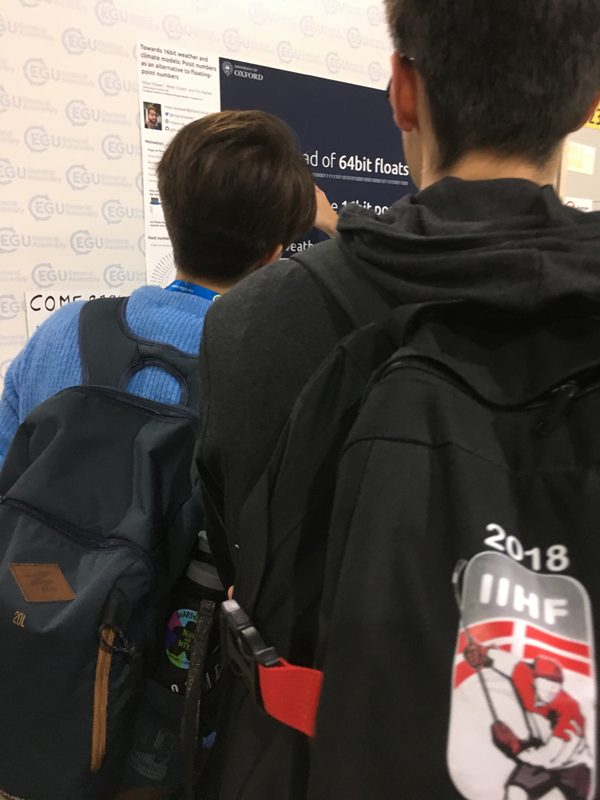 ... Every one of those posters, she actually didn’t know what they were about right away because there was no title at the very top and people were standing in the way. Julie Shapiro’s experience was more positive. Emily Kane also shared another variation of the format in the wild.